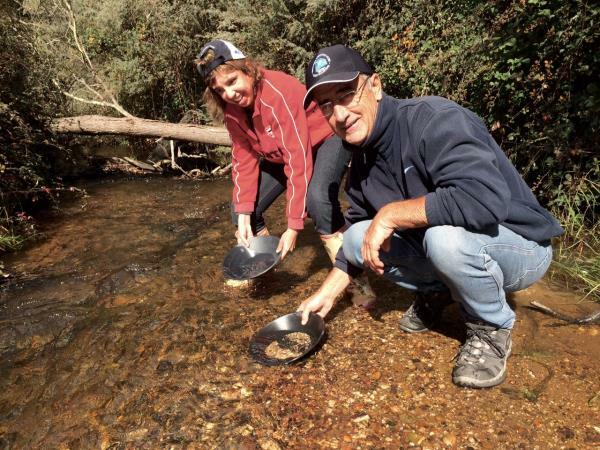 Karingal volunteer Graham O’Meara with participant Sam panning for gold at Dolly’s Creek, Meredith. EACH year 100 Karingal volunteers provide around 16,000 hours of service so people with a disability can live the lives they choose. Graham O’Meara has been volunteering with Karingal’s outdoor activity program, KABLE, for six years. During this time he has become a valued member of the team. “I read Karingal’s advert in the paper and thought it was for me. I haven’t looked back since,” Graham said. The varied activities – such as panning for gold or rock climbing – initially caught Graham’s interest but it is the social aspect that keeps him attending regularly. “The fellowship of the devoted Karingal staff and the uniqueness of each participant’s different personality has been really enjoyable. Every year Karingal recognises volunteer achievements and milestones, with some volunteering with the organisation for over 25 years. Karingal volunteers play a vital role in supporting people with a disability to be actively involved in the community by sharing their skills and experiences in over 100 different activities weekly.